Since the shocking results of the 2016 presidential election, there have been reports that Russians interfered to help Donald Trump win. And now, even former President George W. Bush has agreed that Russia meddled in the 2016 election. Although Bush never named Trump, in a February 8th address he condemned the idea of friendly U.S.-Russia relations, a policy that Trump has long championed. "There's pretty clear evidence that the Russians meddled," Bush said in a talk in Abu Dhabi. "Whether they affected the outcome is another question." 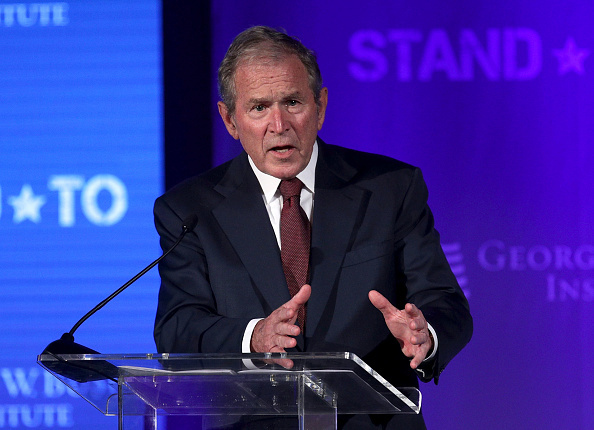 Bush went on to say that Russian interference in the U.S. election system “is dangerous for democracy.” He also expressed his disapproval with the Trump administration for ending the Deferred Action for Childhood Arrivals program. Many intelligence agencies, including the CIA and FBI, agree that Russian agents did attempt to influence the election. Special counsel Robert Mueller, whom Trump reportedly tried to fire in June, is currently conducting an investigation to determine whether or not the Trump campaign colluded with Russia to plan this interference. And Trump has consistently tried to discredit this idea. In November, the president stated that he believed Russian President Vladimir Putin‘s claims that Russia was not behind any interference in the U.S. election, although he later walked back his comments when criticized by intelligence officials. Trump has also attempted to blame any Russian meddling on his predecessor, President Barack Obama. But evidence supporting the Russian hacking narrative continues to surface. Yesterday, February 7th, Jeanette Manfra, the head of cybersecurity at the Department of Homeland Security told NBC that in 2016 Russia had successfully hacked voter registration records in some states. We admittedly still don’t know if Russia’s meddling led to Trump becoming president. But regardless, evidence suggests that Russia did attempt to influence our election, and that alone is terrifying. We believe Bush, the CIA, and the FBI, and we need the government to acknowledge what happened and work to prevent it in the future.